You Don't Have To "Believe" In Chiropractic For It To Work! I always laugh when I hear someone say “I don’t believe in chiropractic”, and I usually tell them that’s ok, because chiropractic is a science, not a religion so belief has nothing to do with it. If you didn’t believe in gravity would you float away into the sky? No, I don’t think so. 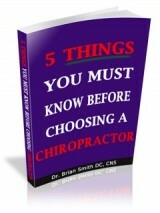 It’s the same with chiropractic – it is based on the scientific principles of how the body functions. Chiropractic care is based on principles found in the sciences of anatomy, neurology, biology, cell physiology, biochemistry and biomechanics. The basis of chiropractic’s ability to alleviate pain has been demonstrated in numerous studies over the years. It may be an over-simplification, but essentially chiropractors perform spinal manipulation (also know as “chiropractic adjustments”), primarily to joints in the spine, improving the function of the nerves that leave the spinal cord in that area. By normalizing the function of the nerves and nervous system, pain can be reduced, muscle spasm can diminish, and joint function can improve. Chiropractic care can be effective in more than just dealing with pain as well. Studies have shown that chiropractic care can have a positive effect on blood pressure and anxiety, dizziness and balance problems, symptoms of pre-menstrual syndrome (PMS), ADHD, and many more conditions that have nothing to do with pain. As a matter of fact, the first chiropractic adjustment ever performed had nothing to do with back pain, but restored the hearing of the man adjusted. Your brain controls everything in the body, even your organs, so doesn’t it make sense that restoring proper nerve flow to your organs just might help them work better too? If you would like a copy of the eBook this post comes from, just email me at drsmith@southernoceanchiro.com and I will send you a pdf copy.